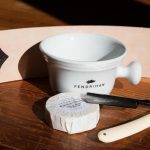 Chances are good that you’ve seen a barber using his strop, either in the movies or while you’ve sat in the chair; he deftly sharpens and polishes his straight razor to perfection, ready for use. But these leather accessories aren’t just for barbers and movie stars. 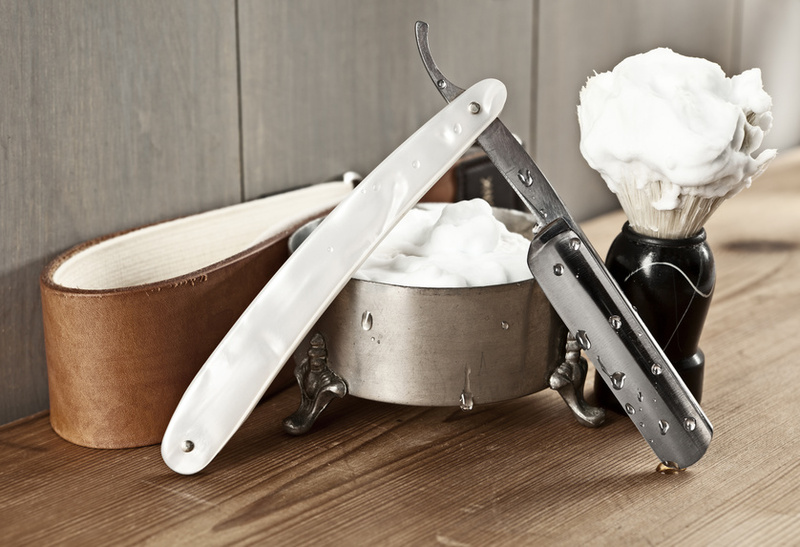 If you have a straight razor, you should also be using a strop at home to keep your blades in tiptop shaving shape. With repeated use the blade of any razor gets dull; after honing your razor, it’s not ready for use until it’s stropped. Stropping smoothes out any rough edges (they’re there even though you might not be able to see them) and realigns the blade. Your razor turns out with a perfect edge for a perfect shave. A strop is generally made of four parts: the leather strip, a fabric strip, a hook or a handle. A hanging strop can be hung from a wall or the back of your bathroom door and held at the other end, while a loom, box and paddle strops are held with one hand. They can all be used to align the blade before shaving. Loom and paddle strops have a shorter, flat surface to work with compared to hanging strops; these tend to be the most commonly used. 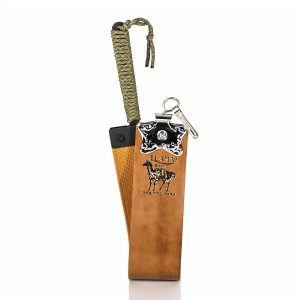 Today’s strops are made of cowhide, horsehide, bison and even synthetic leather. Prices can vary wildly, from about $50, all the way up to north of $500. It’s all in the hide here. Some experts will advise beginners to use cowhide. Why? Because this kind of leather provides a nice draw and they work quite well. Strops made with Russian tanned leather are known to perform extremely well and are of very good quality. Higher-end strops are usually made of horsehide or bison leather. 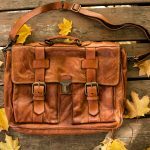 Horsehide leather tends to be slicker – less draw – than cowhide. Cowhide: Gives a light to medium draw, budget friendly and higher priced options, has a very short break-in period. Buffalo: A medium to heavy draw, medium to high priced, medium to long break-in period. 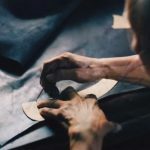 Cordovan (Kanayama): Made from horse shell leather, provides a medium draw, more costly, medium break-in period. English Bridle: Offers a light to medium draw, higher price tag and a very long break-in period. Note: Some strops also come with a fabric strip, generally made from linen or canvas. This is the part of the strop you can use to remove rust (shame on you if your prized straight razor is rusty in the first place though), and gets rid of dirt prior to stropping on the leather side. This is a double-sided box that has two leather surfaces for two different uses. One side can be used with sharpening pastes and the other for pre-shave stropping and finishing. They’re usually made of Mahogany wood. They feature a sliding panel that lets you stow your paste inside, ideal for space saving or travel. A piece of leather is wrapped around a metal or wood bracket in a “loom” shape. Loom strops are somewhat of a niche item – not many places carry them (but we sure do). The benefit here is the ability to adjust tension. You can tighten or loosen the tension on the strip with a simple adjustment. There are various types available. Some are one-sided with one type of material and others have four sides with various types of materials. 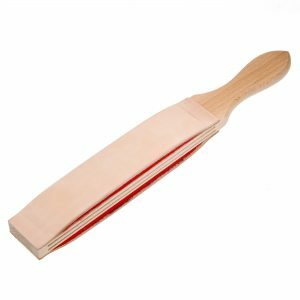 A basic paddle strop has a piece of leather fixed on the wood and more complex strops have sides made of leather, felt and/or canvas. Each side has a particular use and applying honing pastes or compounds and to refresh a dulling blade. They’re also good for giving paddy whacks (but don’t tell anyone we said that). Developed in the 19th Century for the Sweeny Todd era, a hanging strop is the most commonly available type. They’re meant to be hung on a wall or the back of a door and held with one hand. They’re convenient in that they can be wound up and stored tightly for travel or stowing away in the bathroom and there’s one for every budget. What does draw have to do with a strop? The draw is defined as the grip that the leather has on the blade when you’re sliding it along the strop. If the strop has too much draw it could be hard to glide the blade on the leather and it will be hard to control. Some shavers say the draw indicates on how sharp your blade is and beginners can gauge their technique by it by the feedback it gives. You can also gauge your technique by the sound the strop makes. You should hear a swooshing sound when you slide the blade along the strop. You should hear that same sound with each stroke, knowing your being consistent. Hanging strops come in two standard widths: two and three inches. The three-inch pieces allow the most coverage of the blade at once, since most razors are about three inches long). The two-inch strop will require you to use an X pattern stroke in order to refine the whole blade (same as you would when honing). Since the three-inch strop is wider, you can simply glide the blade up and down. The drawback of using a wider strop may be in that you won’t learn the X pattern that’s often required for honing your blade expertly. Most people use their strop before each shave to realign the blade but you can also use it to sharpen the razor and go longer between honing. 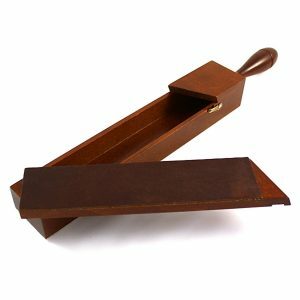 If you intend on using different pastes and compounds, we would recommend a box strop – otherwise you would need more than one leather strip for each task. Think about what you need, versus what you want. A well taken care of strop of good quality can last practically a lifetime. If you’re serious about straight razor shaving (and we think you’ve got it in you), invest in something good. On the other hand, if you’re still learning and worried you’ll slice the Dickens out of your new strop, go with a less expensive one first until you get the hang of it and can then take your pick of the higher priced pieces. Do you want straight leather or a double with material (like canvas) and leather? Stropping on canvas first extends the time between honing sessions. Ready to go shopping? Then start here!